And they say that the West is setting a very poor example. In late 2015, India announced their belief that solar would become cheaper than coal, by 10%, within the next five years. 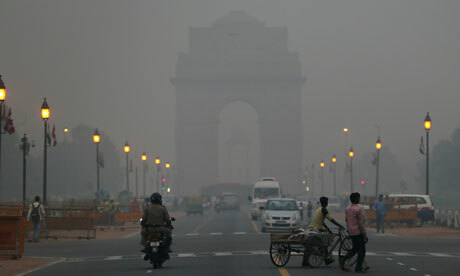 This was a tremendous milestone, considering that India houses 6 out of 10 of the most polluted cities in the world. So what do we do with that prediction? Well, take the next five years, and cut that into one year. India has just announced that solar is now cheaper than coal, and it’s on a fast track to having a hefty supply of it. This is notable, as solar and renewable energy sources are extremely important for reducing air pollution. Especially in poorer, developing nations, this switch from non-renewables to renewables is absolutely crucial. With that switch comes the need to assess costs. Money is always a determining factor. Is it more beneficial to build a solar grid that’s more expensive than building and maintaining a coal-fired power plant? But now, this question may not be necessary, as capital costs are down a staggering 60% in the past four years, and they could continue to decrease even further. The Deutsche Bank has even concluded that solar could overthrow coal by 2020. Solar prices dropped to a record-low in January to 4.34 rupees a kilowatt-hour (KWh). Current coal prices average around 3-5 rupees/KWh. With these stats, and a growing interest in solar, India expects to deploy around 100 Gigawatts of renewable power by 2022. To put that into perspective, one GW of solar can power up to 750,000 homes and is equivalent to two coal-fired power plants. India also plans to supply help to developing countries in the form of expertise in developing clean energy plans—with absolutely no fee. Goyal states that this plan differs from the West, who are setting a bad example in the clean energy pursuit, as they charge way too much for renewable technology. “India should stop following the world and now is destined to lead the world as champion for underdeveloped, clean tech and clean energy,” added Goyal. Goyal will be attending the signing of the Paris agreement on climate change in New York on April 22nd. He hopes to gain support for an Indian-led global solar alliance while he’s there. We only hope that he gets the support he’s looking for – and more.